I used to feel a little snobby towards Mt. Rainier. I mean c'mon it's just one mountain. Yosemite is filled with ridges and peaks and valleys, there is endless exploring and Rainier offers only one view even if it is impressive. Mount Rainier, Emmons Glacier rolling off the slope to the right of the Summit. Oh how wrong I was... Mt. 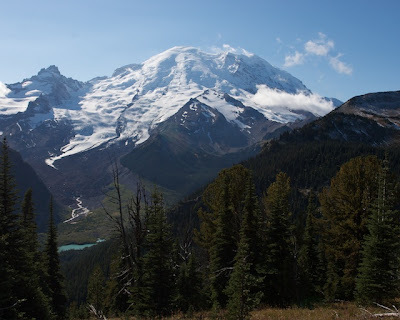 Rainier is perhaps the most stunningly beautiful place I've visited in all my travels. 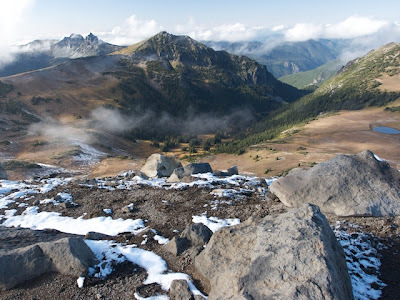 Beautiful sub-alpine meadows, rugged alpine tundra, glaciers hanging off the mountain that crack, burp, and rumble in the background, and a summit that begs you to climb to the top. 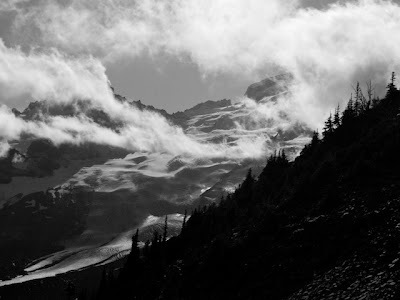 The cloudy summit of Mount Rainier. 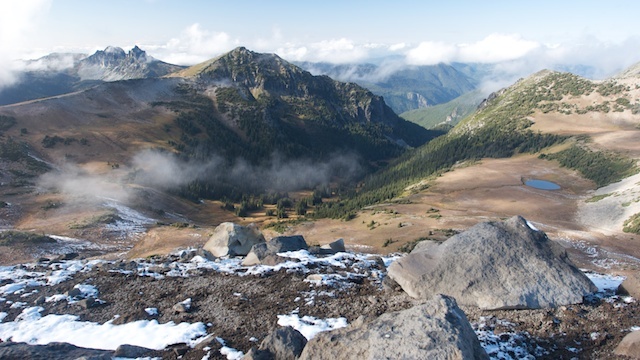 The Burroughs Mountain trail begins from the less popular Sunrise side of Mt. Rainier -- probably a two hour drive around the mountain from Paradise. A gorgeous old lodge sits next to the high elevation parking lot and in the distance the beautiful north face of Mt. Rainier commands attention at all times. 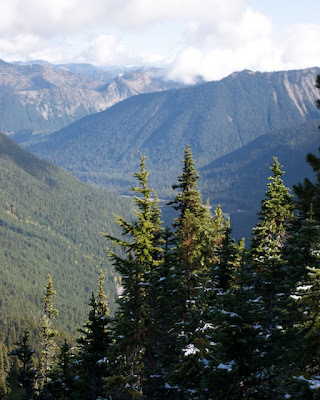 The Winthrop, Emmons, and Inter Glaciers pour in opposite directions down into the deep river valleys. A cold storm was still clearing which had let loose a few inches of snow the previous night dusting the trees and ground around the lodge. Whispy white clouds raced past the summit against a deep blue sky. The trail climbed ever so slowly, cruising through a forest of mountain hemlock much like the one we hiked through on Hurricane Ridge in Olympic National Park a week earlier. 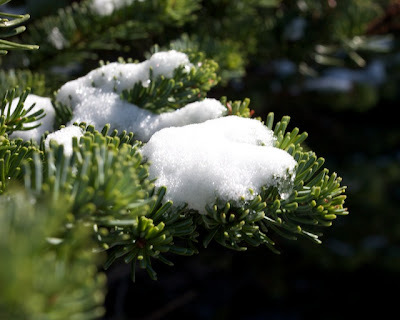 Fresh snow on a Western Hemlock. Just after Shadow Lake the trail begins climbing rather steeply up into the alpine zone. Slowly the forest faded away as trees shrunk in size giving way to small shrubs, and eventually just a world of rock. Interesting patterns in the snow emerged, small 1-6 inch spires of frozen snow clumped together so tightly they almost touched, covering much of the trail in the shadow side of the trail up Burroughs Mountain. Beylah climbing up the slope of Burroughs Mountain. "but you just took a photo just like that, can we keep moving?". "make it less beautiful, then I'll stop!". 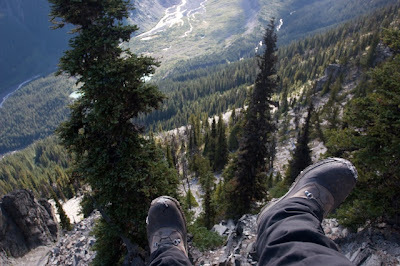 When I caught up to her again I found her sitting on a small flat area walled off with rocks dangling her feet over a cliff which dropped away perhaps a couple thousand feet into the valley of the Emmons Glacier. Dangling my snow boots over the White River. 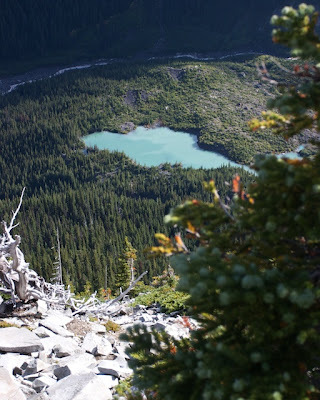 The valley was studded with beautiful turquoise lakes; their color comes from the fine sediment which runs off the glacier which is so light it remains suspended in the water turning it a milky turquoise (the most famous example of this is Lake Louise in Banff National Park). Turquoise Lake at the bottom of the river valley. 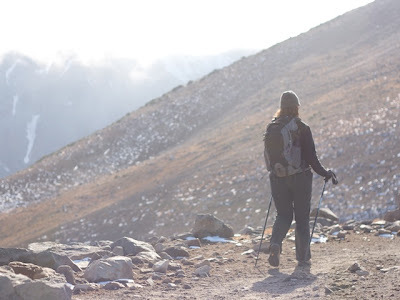 As the trail continued to ascend up the mountain through the moonscape of rock that was the Alpine Tundra, we stopped and watched two bald eagles circling around above us before soaring off into the distance. Near the top the trail evened out and a thick bank of clouds moved in, not only obscuring the summit but everything around us. We returned to the cold, windy, and dark world of the clouds but forged on ahead. Clouds moving in over the trail. And just like that, they cleared, and we found ourselves standing on the rim of a beautiful basin studded with lakes and walled with steep cliffs. We could see far off into the distance in all directions. We were at the trails crest. Clouds hung on the shoulder of the mountains, clinging to them like in such an orderly way they seemed to have been intentionally placed there. 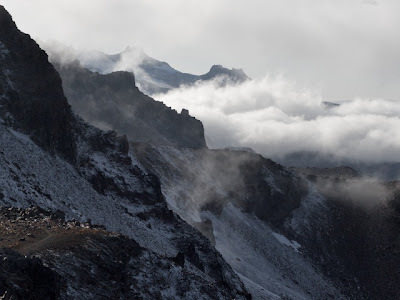 Clouds hanging on the slopes of Burroughs Mountain. Drainage valley of the west fork of the white river. Skyscraper Mountain towering above the large basin. To say this location is stunning is an insult. It is so grand it defies a truthful description. We enjoyed feeling small next to this magnificent landscape and I lament my inability to property describe it now. Beylah surveying the landscape from the trail's crest. 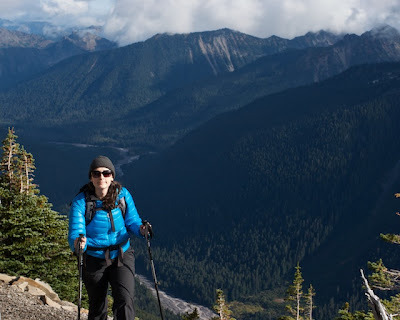 We begrudgingly began the hike back as the sun threatened to drop below the shoulder of Mt. Rainier, having trouble pulling ourselves away from "so much pretty". 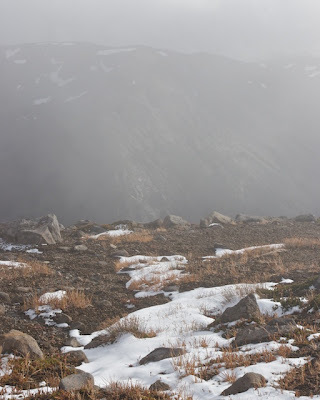 We left the the clouds, descended back through the tundra and into the forest, returning to the subalpine meadows. There they sat, ablaze with the colors of autumn, and before we knew it we were back in the parking lot. Just in time for another cloud burst which swept over the parking lot, and made a rather thrilling descent down the mountain in our little Honda Fit. 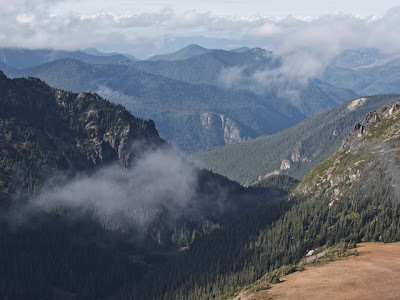 I had a great time hiking to Dege Peak in this same area. Love the fresh snow in your photos. I'm not sure I know where Dege Peak is but it seems tough to go wrong around there. We had a lot of fun with the snow, and there may - or may not - have been some snowballs thrown. I may - or may not - have instigated the throwing of said snowballs.